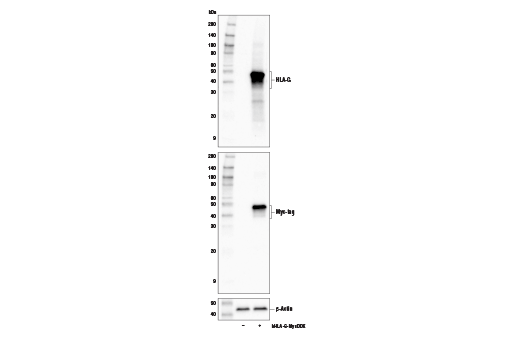 Western blot analysis of extracts from JEG-3 and LNCaP cells using HLA-G (E8N9C) XP® Rabbit mAb (upper) and β-Actin (D6A8) Rabbit mAb #8457 (lower). Western blot analysis of extracts from 293T cells, mock transfected (-) or transfected with construct expressing full-length human MycDDK-tagged HLA-G (hHLA-G-MycDDK; +), using HLA-G (E8N9C) XP® Rabbit mAb (upper), Myc-Tag (71D10) Rabbit mAb #2278 (middle), and β-Actin (D6A8) Rabbit mAb #8457 (lower). 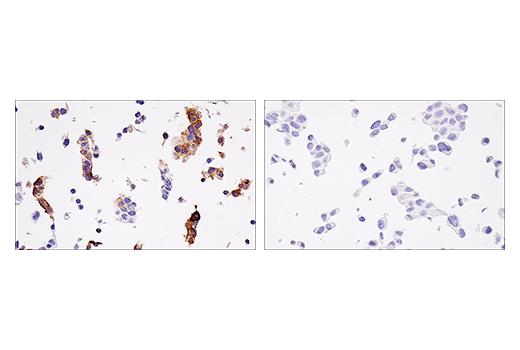 Immunohistochemical analysis of paraffin-embedded JEG-3 cell pellet (left, positive) or LNCaP cell pellet (right, negative) using HLA-G (E8N9C) XP® Rabbit mAb. 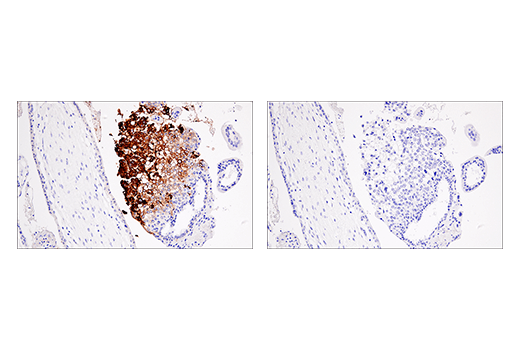 Immunohistochemical analysis of paraffin-embedded human placenta using HLA-G (E8N9C) XP® Rabbit mAb (left) compared to concentration matched Rabbit (DA1E) mAb IgG XP® Isotype Control #3900 (right). 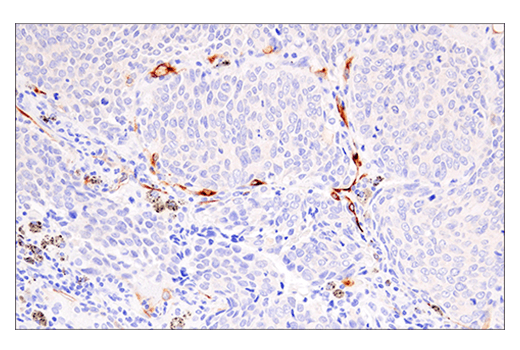 Immunohistochemical analysis of paraffin-embedded human lung adenocarcinoma using HLA-G (E8N9C) XP® Rabbit mAb. 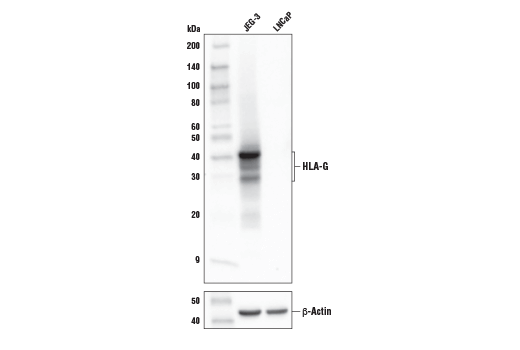 HLA-G (E8N9C) Rabbit mAb recognizes endogenous levels of total HLA-G protein. Monoclonal antibody is produced by immunizing animals with a synthetic peptide corresponding to residues surrounding Leu102 of human HLA-G protein. HLA-G (HLA-G histocompatibility antigen, class I, G) is a non-classical MHC molecule expressed by trophoblasts in placenta, thymic epithelial cells, and some tumors. Alternative splicing leads to generation of at least six isoforms, four that are transmembrane proteins and two that are soluble (1-4). It is an inhibitory molecule involved in immune tolerance and escape, originally studied for its role in maternal tolerance of the fetus during pregnancy (1-5). HLA-G binds ILT2, ILT4, and KIR2DL4, playing a role in the regulation of natural killer, T, and monocyte/macrophage cells (4-5). Its involvement in evasion of immune response makes it a potential target for immunotherapy (6). Kovats, S. et al. (1990) Science 248, 220-3. Pazmany, L. et al. (1996) Science 274, 792-5. Fujii, T. et al. (1994) J Immunol 153, 5516-24. Shiroishi, M. et al. (2003) Proc Natl Acad Sci U S A 100, 8856-61. LeMaoult, J. et al. (2005) FASEB J 19, 662-4. Curigliano, G. et al. (2013) Clin Cancer Res 19, 5564-71.